Sunday January 31st 1897 We did not get around in time to go to church but went over to Woolfs for dinner. Had a very pleasant visit. Was at home a little while too. Did the evening work and read till bed time. Monday February 1st 1897 We got up very early and John took his teams and went right on to the valley. Will finished up the work and I fixed dinner for the men and we went down about ten oclock. I spent the day with Ella. Will came home in time to do chores. They are getting on fine with the ice. It was late when John got home. Tuesday February 2nd 1897 John went back to the valley this morning. Will helped me wash. I was busy with other work about the house in the afternoon. In the evening I wrote some and peeled apples to put up. 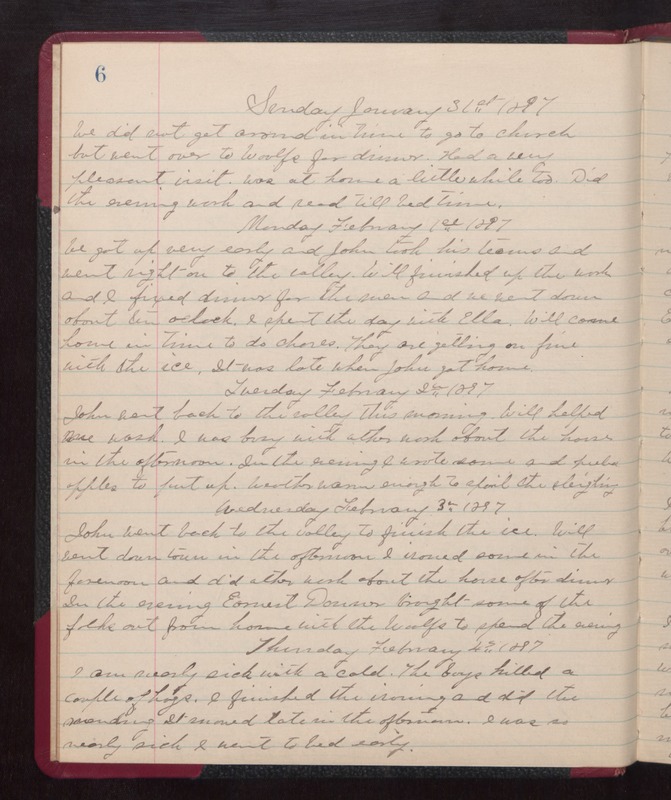 Weather warm enough to spoil the sleighing Wednesday February 3rd 1897 John went back to the valley to finish the ice. Will went down town in the afternoon. I ironed some in the forenoon and did other work about the house after dinner. In the evening Earnest [Dowson?] brought some of the folks out from home with the Woolfs to spend the evening Thursday February 4th 1897 I am nearly sick with a cold. The boys killed a couple of hogs. I finished the ironing and did the mending. It snowed late in the afternoon. I was so nearly sick I went to bed early.